is a resource for the promotion of "skills for a better world". It is in active use by teachers that wish to teach themes related to peace, or wish to promote peace skills in their classrooms, and for facilitators of workshop in peace related themes. The website is also used as a resource for workshops at summer camps and seminars, both in connection with youth work and by voluntary organisations involved in training mediators, teaching for intercultural/interreligious dialogue and other such activities. Many skills must be developed to nourish peacework. Specialised competence is needed to support all the measures that make a holistic input for peace. A great deal and diversity of knowledge is needed to develop the best strategies. This is beautifully exemplified by the Peacework Tree diagram, created by Tim Wallis, former director of Nonviolent Peaceforce. Educationforpeace-dot-com focuses on the skills regarded as the core peace skills: communication, conflict transformation, personal conflict management, promoting positive attitudes, dialogue and more. 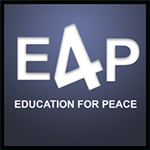 Educationforpeace-dot-com gives a short introduction to education for peace and its pedagogical platform, and describes how to build up a successful workshop around a topic. You will find suggestions for exercises and games for the various stages of the workshop, together with various educational "packages" and activities for each topic to be covered, skill to be trained, or stage of the workshop (warming up, evaluation etc.) - see the drop down menus above. The site includes over 200 different activities. The aim and instructions for each activity is included, in addtion for the time required and the age group most suited. Some of the activities are limited to certain age groups and themes. Others fit into a broad range of educational situations. Some we have made ourselves, others we have "borrowed" (with permission) from other webs sites and books. All of the excercises have been quality assured by trials in various Oslo schools, and workshops on the basis of other countries, such as Canada, Palestine, Egypt, Mexico, Indonesia, Kyrgyzstan, Azerbaijan, Ukraina and Syria. We apologize if we have placed any exercises here that have orginated from your organisation without acknowledgement - please contact us, so that we can link to your organisation if you recognize any of "your" exercises (or remove them if you would prefer!). The Norwegian Peace Council has now entered a partnership with Peace Action Training and Research Institute of Romania (PATRIR) and Nansen Dialogue Center Serbia for a project on violence in schools. Participation in Decision Making: Reducing violence among youth by improving the public policies for preventing and combating violence in schools at local level� is a PATRIR project, designed in collaboration with the Norwegian Peace Council from Norway and the Nansen Dialogue Centre from Serbia.Through this project, we aim to empower a multi-sectoral group of active citizens from Cluj-Napoca that, together with the project coordinators and foreign experts, will conduct a comprehensiv conflict analysis on the topic of violence in schools, in order to bring improvements to the existing policies that should address it. The multi-sectoral group will be guided to make use of public consultations and dialogue sessions, awareness raising campaigns, create inter-sectoral partnerships and based on an international comparative study on the addressed topic, formulate and put forward 2 policy proposals to the Cluj-Napoca City Hall and Cluj County School Inspectorate that will contribute to the preventing and combating of violence in Cluj-Napoca schools. More information related to the project here. Thank you for visiting our site. We hope that you enjoy the activities and find them as useful as we have.